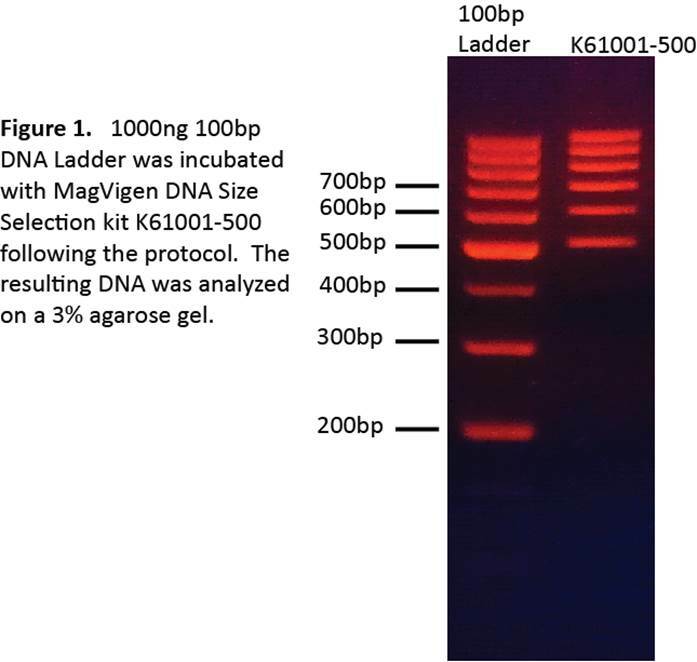 In general, use 1X-4X volume of MagVigen™ DNA Select nanoparticles per 1X volume of DNA sample. Example: If the DNA-containing solution has 20μl volume, then use 20-80μl of MagVigen™ DNA Select nanoparticles for capture. Important: Always resuspend nanoparticles in fresh Capture Solution before usage. Vortex MagVigen™ DNA Select nanoparticles for 10-20 seconds before use. Remove 4X volume of MagVigen™ DNA Select nanoparticles and put into a clean 1.5ml reaction tube. For every 20μl DNA sample, resuspend the nanoparticles in 30μl Capture Solution 500. Note: A volume ratio of 20:30 for DNA : Capture Solution must be followed in order to separate DNA>=500bp. Incubate the MagVigen™ DNA Select nanoparticles-DNA reaction at room temperature for 15-30 minutes. Keeping the magnet in place, wash the DNA-captured nanoparticle pellet by adding 100μl freshly prepared 70% ethanol. Let stand for 30 seconds-1 minute. Gently pipette to mix well and incubate for 5-10 minute at room temperature.